To be actually inside the tiny, junk-filled room where the performance of “The Caretaker” takes place is a deliciously unsettling test of wits for an audience. Gone is that safe sense of partition between the playgoer and the onstage craziness in which the play’s harrowing battles unfold. 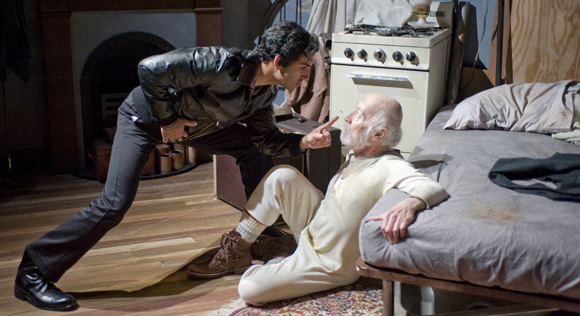 Director Ron OJ Parson and the Writers’ Theatre production team — Jack Magaw’s sets, Heather Gilbert’s lighting, Nick Heggestad’s props — have put the company’s tiny Vernon Avenue space to bone-chilling use for Harold Pinter’s 1960 psychological thriller. There’s only one door to this production’s human cage, which feels claustrophic to start with. And the audience is on the inside of it when the play closes in. The first character to appear out of darkness is an immediate threat, so sudden and close is the encounter. But there he is. He offers no information about himself beyond his late-twenties sleekness, his leather jacket, his silent stares about the motley room and his panther-like departure upon hearing a noise. Could be dangerous, this one. It takes a bit more time before the play’s other two characters — the slow-witted tenant of the room we are in, and an old tramp he rescues from a beating — reveal themselves as something other than harmless prey. The shifting dynamics among these three very different creatures form the hair-raising arc of Pinter’s story. Mick, the leather jacket guy, turns out to be the younger brother of Aston, the slow-witted one. 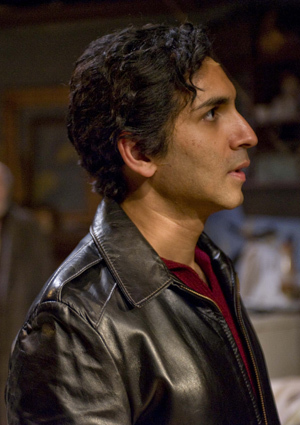 Writers’ Theatre has cast them with a formidable pair of actors — Kareem Bandealy and Anish Jethmalani. Both are of South Asian descent. It’s an intriguing choice that adds a layer of richness to Pinter’s mid-20th century London setting. The city’s population was a robust colonial mix in a still-rigid society with lingering, race-based class distinctions. It was the sort of environment, in short, that would allow a British beggar at the bottom of the food chain to feel superior. When Davies — Pinter’s tramp — unthinkingly utters a few slurs out of habit in spite of the company he’s in, there’s a familiar awkwardness in the room that subtly anticipates the play’s escalating sense of foreboding. Bandealy is superb as the hot-tempered Mick, nastily good at the long conversation in which he takes the tramp’s measure and plays him like Heifetz played his Strad. The lights-out scare — I won’t give away the implement of terror — is ghastly funny at fever pitch, and Bandealy fully inhabits the sadistic tendency and angry self-delusion that traps Mick even as blood loyalty courses in his veins. Bill Norris, as the wary vagabond with a ready excuse for every challenge, plays the old man as a memorable narcissist. Norris elicits affection for the tramp’s charms at first blush, then amusement at his craftiness, followed by growing repulsion over his usurping ways, yet with room for a little sympathy at the inevitable come-uppance. The character of Davies is not unlike Richard III in that way; it’s the actor’s job to make us want to follow him on that inglorious journey, and Norris does. 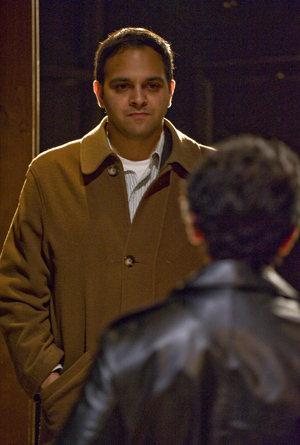 Anish Jethmalani — as Aston, the slow soul who’s not quite right — has one of the great Pinter monologues, the vividly halting account of how he got to be that way, as told to the unsympathetic Davies. 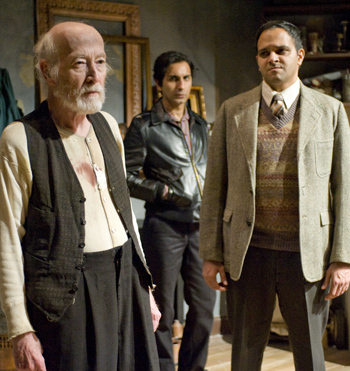 Jethmalani’s noble performance seems to stop time as Aston strains to remember details that were probably erased from his brain, and to otherwise connect the dots in his achingly sad life. At this point in the history of Pinter’s lauded play, it is possible to see an excellent version on film and to catch key scenes on YouTube featuring a variety of fine regional actors. But that is not the same as witnessing “The Caretaker” in such powerfully intimate confines — a mere pocket of a space with a few dozen seats surrounding actors who speak in normal voices and who carry out their lies, threats and songs of lament at barely arm’s length. The part of the story that noisily transpires outside the room threatens us as well, and by the end of the tale, nerves are definitely jumping. Parson’s first-class direction draws natural rhythms from the players, and tension builds steadily. Not only is there no sense of overt acting, which would be deadly at this close distance, but also there’s no hint of the in-the-round maneuvering that must have been a constant challenge.